By 2015, dedicated freighters represent 43% of the 700 billion ATK capacity, while 57% is carried in airliner's cargo holds, and Boeing forecast Belly freight to rise to 63% while specialised cargoes would represent 37% of a 1,200 billion ATKs in 2035. In the UK during the early 1920s, the need was recognized for a freighter aircraft to transport troops and materiel quickly to pacify tribal revolts in the newly occupied territories of the Middle East. The Vickers Vernon, a development of the Vickers Vimy Commercial, entered service with the Royal Air Force as the first dedicated troop transport in 1921. In February 1923 this was put to use by the RAF's Iraq Command who flew nearly 500 Sikh troops from Kingarban to Kirkuk in the first ever strategic airlift of troops. Vickers Victorias played an important part in the Kabul Airlift of November 1928–February 1929, when they evacuated diplomatic staff and their dependents together with members of the Afghan royal family endangered by a civil war. The Victorias also helped to pioneer air routes for Imperial Airways' Handley Page HP.42 airliners. In the years following the war era a number of new custom-built cargo aircraft were introduced, often including some "experimental" features. For instance, the US's C-82 Packet featured a removable cargo area, while the C-123 Provider introduced the now-common rear fuselage/upswept tail shaping to allow for a much larger rear loading ramp. But it was the introduction of the turboprop that allowed the class to mature, and even one of its earliest examples, the C-130 Hercules, in the 21st century as the Lockheed Martin C-130J, is still the yardstick against which newer military transport aircraft designs are measured. Although larger, smaller and faster designs have been proposed for many years, the C-130 continues to improve at a rate that keeps it in production. 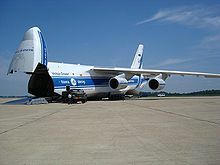 When the Airbus A380 was announced, the maker originally accepted orders for the freighter version A380F, offering the second largest payload capacity of any cargo aircraft, exceeded only by the An-225. An aerospace consultant has estimated that the A380F would have 7% better payload and better range than the 747-8F, but also higher trip costs. Many types can be converted from airliner to freighter by installing a main deck cargo door with its control systems; upgrading floor beams for cargo loads and replacing passenger equipment and furnishings with new linings, ceilings, lighting, floors, drains and smoke detectors. Specialized engineering teams rival Airbus and Boeing, giving the aircraft another 15-20 years of life. Aeronautical Engineers Inc. converts the Boeing 737-300/400/800, MD-80 and Bombardier CRJ200. Israel Aerospace Industries’ Bedek Aviation converts the 737-300/400/700/800 in about 90 days, 767-200/300s in about four months and 747-400s in five months, and is looking at the Boeing 777, Airbus A330 and A321. Voyageur Aviation Corp located in North Bay, Ontario converts the DHC-8-100 into the DHC-8-100 Package Freighter Conversion. An A300B4-200F conversion cost $5M in 1996, an A300-600F $8M in 2001, a MD-11F $9M in 1994, a B767-300ERF $13M in 2007, a B747-400 PSF $22M in 2006, an A330-300 P2F was estimated at $20M in 2016 and a B777-200ER BCF at $40M in 2017. By avoiding the main deck door installation and relying on lighter elevators between decks, LCF Conversions wants to convert A330/A340s or B777s for $6.5M to $7.5M. In the mid 2000s, passenger 747-400s cost $30-50 million before a $25 million conversion, a B757 had to cost $15 million before conversion, falling to below $10 million by 2018, and $5 million for a 737 Classic, falling to $2-3 million for a B737-400 by 2018. Derivative freighters have most of their development costs already amortized, and lead time before production is shorter than all new aircraft. Converted cargo aircraft use older technology; their direct operating costs are higher than what might be achieved with current technology. Since they have not been designed specifically for air cargo, loading and unloading is not optimized; the aircraft may be pressurized more than necessary, and there may be unnecessary apparatus for passenger safety. Boeing flew an electric vertical takeoff and landing (eVTOL) prototype. Carpinteria, California-startup Dorsal Aircraft wants to make light standard ISO containers part of its unpiloted freighter structure where the wing, engines and tail are attached to a dorsal spine fuselage. Interconnecting 5–50 ft (1.5–15.2 m) long aluminum containers carry the flight loads, aiming to lower overseas airfreight costs by 60%, and plan to convert C-130H with the help of Wagner Aeronautical of San Diego, experienced in passenger-to-cargo conversions. ^ "World Air Cargo Forecast" (PDF). Boeing. 2016. ^ Andrews and Morgan 1988, pp. 158–159. ^ Kay, Anthony (2004). Junkers Aircraft and Engines 1913-1945. London: Putnam Aeronautical Books. ISBN 0-85177-985-9. ^ Ben Hargreaves (Sep 27, 2018). "Available Aircraft Feedstock Limiting Cargo Conversions". Aviation Week Intelligence Network. ^ Andy Cline (Apr 21, 2017). "Voyageur Unveils DHC-8-100 Package Freighter Conversion". ^ "Converting the A340" (PDF). Airline Economics. March 2014. ^ Aircraft Value News (November 26, 2018). "Growth in Freighter Fleet Fails to Bolster Values Of Older Types". ^ Graham Warwick (Feb 2, 2018). "Unmanned Cargo Aircraft Head Toward Flight Tests". Aviation Week & Space Technology. ^ Graham Warwick (Mar 19, 2018). "The Week In Technology, March 19-23, 2018". Aviation Week & Space Technology.